The first of those two spots I want to talk about is the Byodo-In Temple. This is a Buddhist temple, which was dedicated in August 1968 to commemorate the first Japanese immigrants to Hawaii. It is a replica of a temple located in Kyoto, Japan. Inside the temple, there is an 18ft Amida Buddha. The Hawaiian Byodo-In Temple can be found in the Valley of the Temples Memorial Park. The park is located near the east coast of Oahu and was founded in 1963. Many Buddhist, Shinto, Protestant and Catholic residents of Hawaii are buried there. This makes for a perfect day trip: If you start in the morning, you have enough time to wander around the Memorial Park and enjoy the fantastic landscape and nature. You can explore the temple in detail, feed the Koi with some fish food pellets you can buy on site, have a stroll through the coniferous and bamboo forests, feed the black swans (which are incredibly beautiful), visit the gift shop to buy some souvenirs, and find a quiet place to meditate for a bit. After this, you can easily head to a beach close by, find some food, and enjoy the rest of the day. Pearl Harbor is, as I have already mentioned, a lagoon harbour west of Honolulu and about an hour’s drive away, if you take the bus. On December 7, 1941, the so-called Battle of Pearl Harbor took place. The Imperial Japanese Navy Air Service executed a military strike against the harbour, which left more than 2,400 people dead, both soldiers and civilians, and many more wounded. Many ships and submarines were damaged and sunk, with the most famous battleship being the USS Arizona. This tragedy was the reason why the USA entered World War II. Today, the sunken USS Arizona can still be visited in Pearl Harbor at the Arizona Memorial. I spent a whole afternoon at the harbour, as there was so much to see. 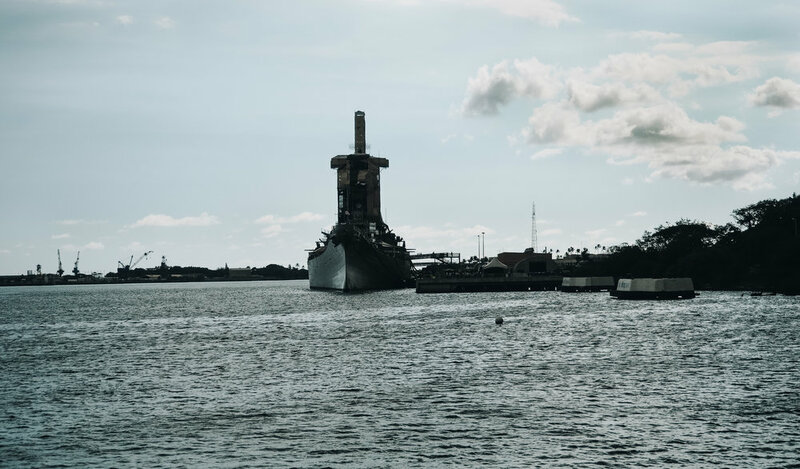 You can visit and explore a real submarine, find out all about the horrendous attack on Pearl Harbor and WWII in the museum on the grounds and, of course, go have a look at the Arizona Memorial. To reach this, you first watch a 30-minute film about the attack and WWII from the view of the US, and then board a small boat that takes you to the memorial. This memorial was directly built on top of the sunken battleship, which can be seen below the surface. Some parts of the old ship even rise above the water surface. Something else that can be seen on the surface of the ocean surrounding the memorial is oil from the sunken Arizona, which is now called “the tears of the Arizona.” I also learned that all soldiers who once served on the USS Arizona who survived the attack in 1941 and have died since, can request to be buried inside the ship to be with their fellow soldiers and crew once again.